A few weeks ago, a couple of astronomers made headlines when they announced that they’d found a planet orbiting a distant star. It was hardly the first: since 1995, about 500 planets have been discovered in orbit around stars beyond the Sun. What made this one extraordinary was, first of all, that it wasn’t all that much bigger than Earth, where the earlier finds have been mostly giant balls of gas, like Jupiter. More important, it orbited smack in the middle of the “Goldilocks zone” — at just the right distance from its star where temperatures would be not too hot, not too cold, but just right for the existence of life as we know it. 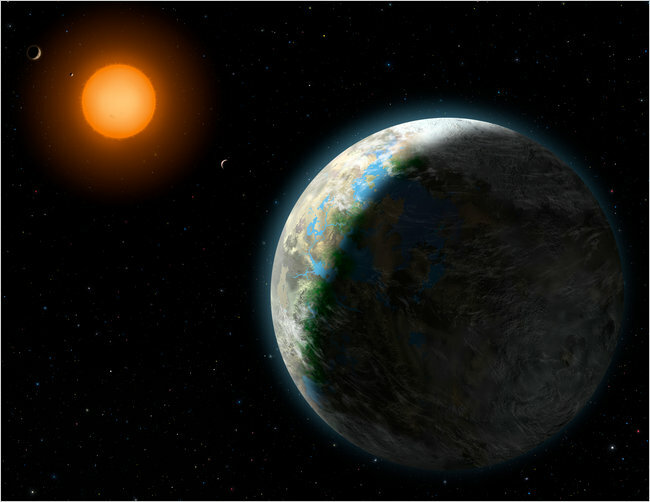 (That balmy location is more properly called the “habitable zone;” in our solar system, only Earth qualifies.) Sadly, for me, there’s now serious doubt that the planet exists at all; the “discovery” may have been announced prematurely. Speculation about extraterrestrial life left the realm of philosophy for astronomy in 1960, when a young astronomer named Frank Drake wondered if it would be worth his time to search for radio signals from alien civilizations. He understood that it might not be worth his reputation: the golden age of flying saucers was in full swing; “The Twilight Zone” was a hot new show; and Ed Wood had just produced “Plan 9 from Outer Space”, often rated the worst movie of all time. So Drake was cautious. He came up with a formula — which came to be known as the Drake Equation — to calculate how many planets might have life. It was more or less a checklist: How many stars are there in the Milky Way? How many of them have planets? How many of the planets might be suitable for life, based on their distance from stars? And so on. Nobody had an answer to anything more than the first question — planets are dark, and too far away to be seen — until 1995, when astronomers finally began to find planets by the hundreds. The Search for Extraterrestrial Intelligence wasn’t necessarily crazy. There’s still a way to go, of course. In this planet-searching endeavor, the caveat is a biggie: finding a planet that could harbor life isn’t the same as finding one that does — and it’s very possible that the only aliens living there are bacteria, which don’t build radios. But more news is waiting in the wings. For almost two years now, a space telescope called Kepler has been staring unblinking at more than 100,000 stars, looking for a planet, and the team has an announcement scheduled for February 1. Kepler was built to detect objects (like planets) passing in front of stars. Depending on how much the starlight dims, they can say how big the planet is; depending on how often it happens, they can tell how long the planet takes to complete an orbit, which tells you how far it is from its sun. Here’s the trick: Kepler mission rules say it doesn’t count until you’ve seen it pass by three times, to avoid the embarrassment of another retracted ‘discovery.’ In less than two years of operation, Kepler can’t have seen three passes separated by a full year each, so any Earthlike planet they do announce will be in less than a year-long orbit. But that key discovery could well come in the following year. I for one am praying for front-page headlines when the Kepler crew steps up to the microphone in February. I’m working on a book, and I rashly promised my editors that Earthlike planets would be found before I turn in the manuscript next August. Either the planets come out, or I go into hiding. Harlan Ellison is a lot like the stories he writes: intense, ingenious, and slightly deranged. Ellison has made a career writing “speculative fiction” (a title he prefers to the more mainstream “sci-fi”). He’s also had a prolific career in Hollywood, working on groundbreaking TV shows like “Star Trek“, “The Twilight Zone“, and “The Man from U.N.C.L.E.“. Ellison is also notorious for extreme behavior. Like many great rebels, he ran away from home at 13 to join the carnival. And during college he was expelled for punching an overly critical professor. Among the items on “The Big, Big List of Ellison Goodies”: an original screenplay for an episode of “The Outer Limits” and two personally inscribed copies of Sandman: Book of Dreams (birthday presents from author and friend Neil Gaiman). You can see the full list here.